Plot: Product Description: Ten women find themselves in a vacant mansion on Spektor Island in December, 1972. Each believes she's traveled to the house on business, but they all agree that something seems strange. For one thing, the entire house is full of pictures and statues of pigs. The women all come from drastically different walks of life. None of them would have chosen to spend the night together in such an eerie place, but the last ferry for the mainland has just left, and a terrible storm is rolling in. Trying to make the best of an unpleasant situation, they raid the mansion's wine cellar and throw a party. As the night creeps on, however, it becomes clear that someone--or something--has lied to get them in the house. It's not long before someone mentions that Spektor Island is supposed to be haunted. Of course, no one in the house believes in ghosts. Here is another horror film brought out on DVD by the one and only company Brink Vision, who honor and respect true independent cinema of all genera’s. 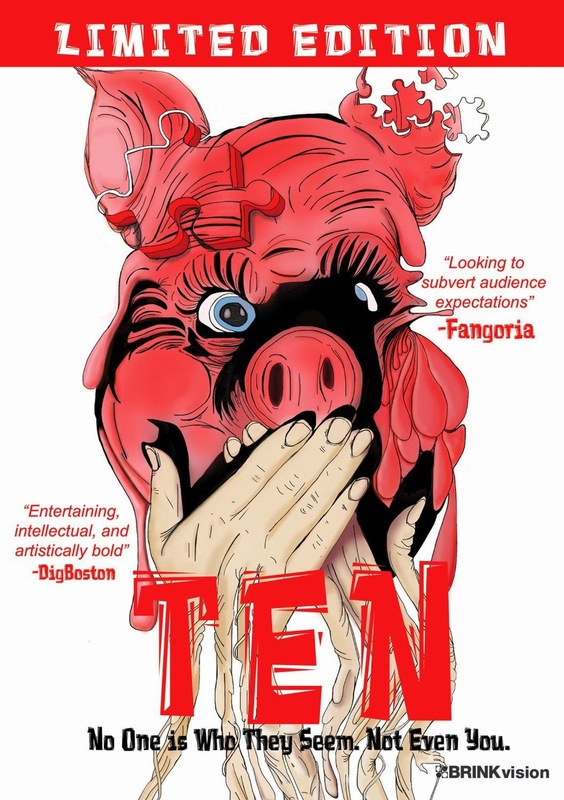 Ten is a unique and twisted experience of a social commentary style horror. A weird journey into a low budget insanity that sends the viewer, into an acid trip. This is best described as an art-house horror. An exploration of twists and turns. This can be described as a Fever dream of a darkened trip, with a spiral layered plot of twists and images, that come across as dreamlike. A film that could quickly become a cult classic. This has all the trademarks of a 70's film. I see a midnight movie. A throwback to 70’s style Drive-in flare. This is a priceless example of how to accomplish a weird, different and truly original film. This is equal parts old-school horror, with equal parts cult style, art-house film. Directed by Sophia Cacciola and Michael J. Epstein. Also co-written by Michael J. Epstein and Sophia Cacciola. Others who wrote the story are Jade Sylvan who also stars in it as the character of The Renegade. Sarah Wait Zaranek also writes part of the film. Simply put everyone had apart in making this film. The film comes together with a Drive-In style, double-bill feature, all one needs is a fat man dressed in a ghoul suit to introduce the feature film. This is like Scooby Doo on LSD. If you have ever seen the cult classic Nobuhiko Obayashi's House (1977), this bleeds that mentality. Ten is hard to explain unless you have seen it. The acting and dialogue and actions by the actresses might be looked at, as horrible or stale, or as if they are reading cue cards or waiting for one another to say each other’s line, but that is the point. The movie is supposed to be weird, stale and confusing, and also poking fun at itself. This is film that pokes fun at, or showcases the stereotypes of women and how woman’s emotions or characteristics are fabricated for cinema. For instance, each one of the girls represents a stereotype in cinema, specifically horror cinema. You have the religious type, who always spews the right way or the wrong way. You have the lesbian renegade tough girl, and there I just stereotyped, because of the way she is dressed and the tough mentality, I did what culture and cinema does. The dumb college party girl. The stuck up model. The, I see dead people medium. The business money maker real estate investor. The book smart historian library type. The educated doctor. The over-top actress. If one looks at all of cinema, one of those stereotypes are in a movie. In most movies, the man is just the man, whereas the woman, is always something, or categorized as one of those. Some will get this movie and others won’t. This is a mixed bag of actions and over the top weirdness, and often times comical. I find this movie unique and one of a kind. It’s different on so many levels. It’s a statement, and also a genre commentary. It’s a mystery and an examination of the female in cinema.